Here is an update to my post of last month. Hopefully, it is self-explanatory enough for now. I will post additional drawings and descriptions of the public outdoor space (#11, ice cream window, picnic area, etc.) as I am able. 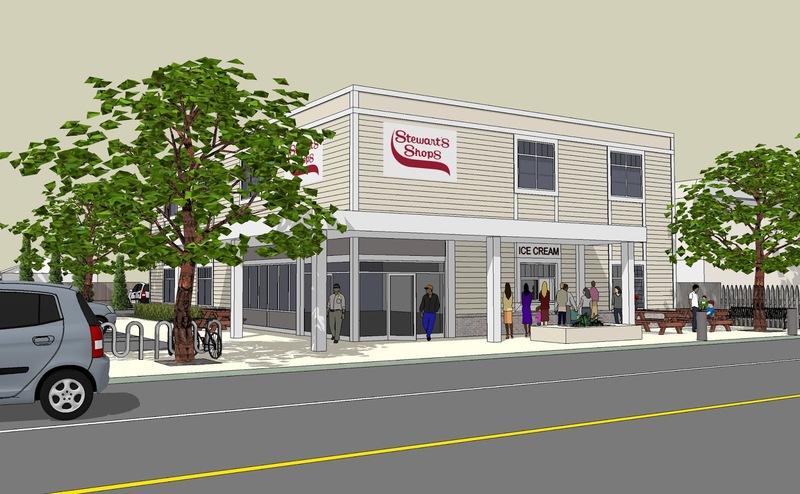 EDIT: Here is a closer view of the building as seen from Fairview Avenue, showing the corner entry, ice cream window, and outdoor space. There may have been some confusion last month as to what I mean by "corner entry": there are two doors located a few feet from the front left front building corner. One faces the street, the other faces the gas pumps. (The two men pictured have just exited from the respective doors.) Because everyone comes and goes from one location, sociability is increased, while security concerns for employees are eased, as they effectively have to watch only one entry/exit.